Bugatti at the New York International Auto Show 2019. French hyper sports car manufacturer Bugatti has today debuted a tribute to France in North America with the unveiling of the Chiron Sport “110 ans Bugatti” at the New York International Auto Show. The sold-out, limited-edition masterpiece commemorates 110 years of Bugatti heritage with exclusive, stylistic design cues, honoring the company’s homeland of France, while also representing Bugatti’s 110th anniversary as an engineering marvel for the 21st Century. 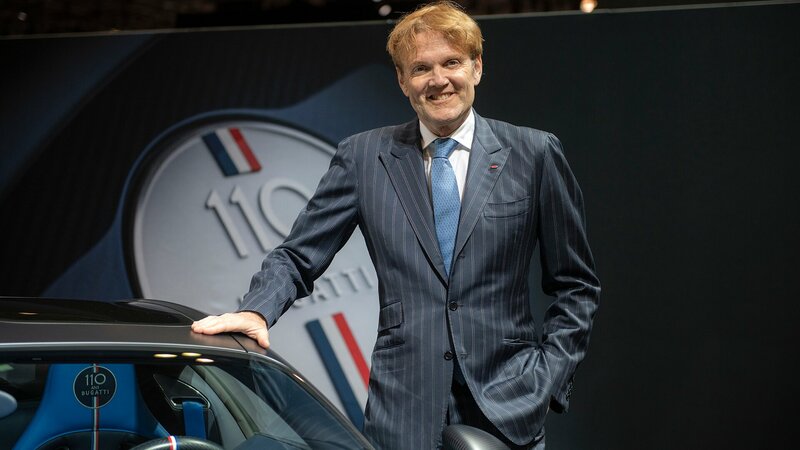 Maurizio Parlato, Chief Operating Officer of Bugatti of Americas, was in attendance at the Jacob K. Javits Convention Center in Manhattan to unveil the special Chiron Sport “110 ans Bugatti” to an array of media and VIPs, all eager to glimpse the special car in person during the New York automotive salon’s first press preview day. Limited to 20 examples, and with an exclusive hand-crafted interior, the Chiron Sport “110 ans Bugatti” bears several tributes to the hues of France, with the tricolor “Le Bleu-Blanc-Rouge” symbolizing the famous ideals of liberty (blue), equality (white) and fraternity (red). Carbon Fiber makes up the body and the front end, while the Bugatti line and Bugatti radiator are crafted in aluminum. Additional salutes to France include the underside of the rear spoiler, which shows the French flag over its entire width, as well as the headrests and back rests of the sports seats, which are decorated by high-quality embroidery bearing the French flag in a vertical position with the “110 ans” logo. As the world’s first production sports car with 1,500 horsepower, the 8.0-liter W16 engine with four turbochargers of the Chiron can reach 62 mph in 2.4 seconds (0-100 km/h) before hitting 261 mph (road limited) as an unfathomable maximum speed, solidifying its place as the pinnacle of automotive technology.